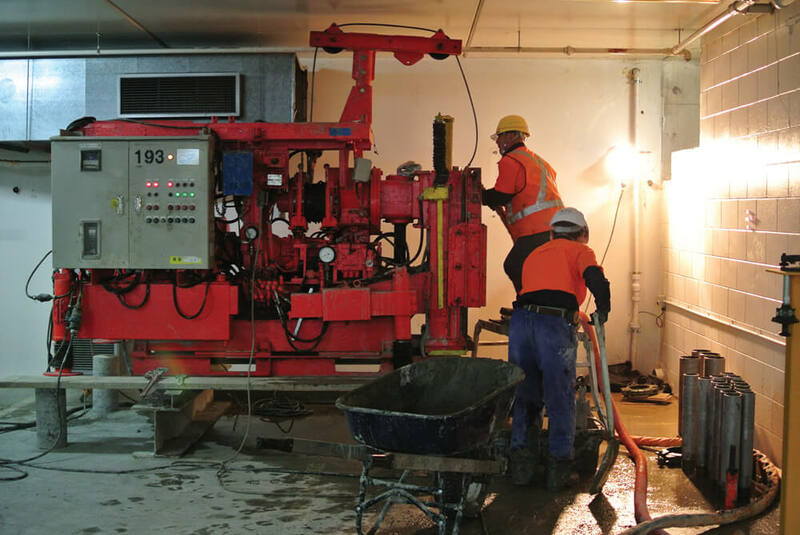 Jet Grouting, or Jetcrete, is accomplished with high pressure, high velocity jets located in a grout monitor attached to a drill stem. After advancing to required depth, the monitor is rotated as it is withdrawn. 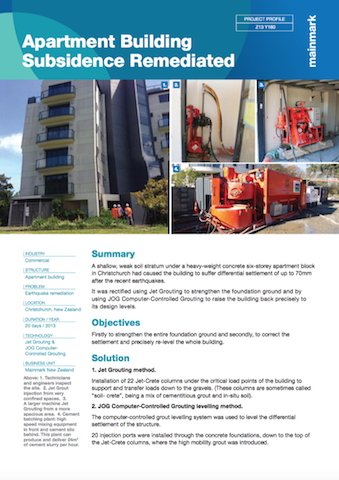 Simultaneous water-jetting and slurry-jetting hydraulically erodes, mixes and partially replaces the soil with cementitious slurry, to create engineered ‘soil-crete’ of high strength and low hydraulic conductivity. 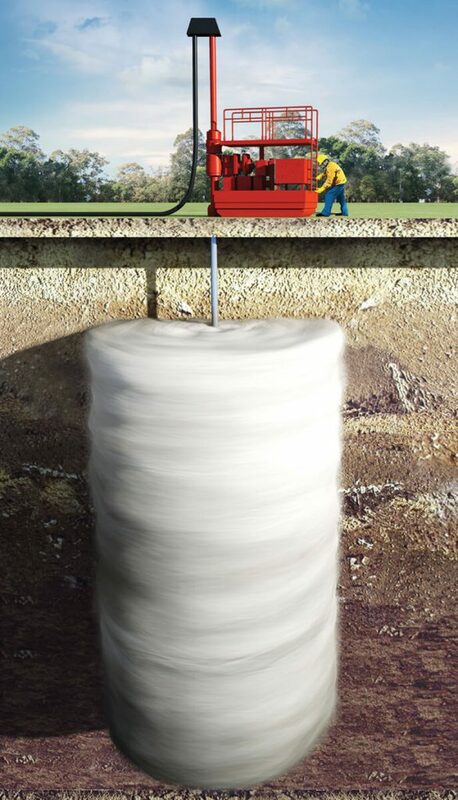 Jet Grouting can be performed to great depths, around obstructions, such as underground piping, above or below the water table and in a variety of soil conditions, from plastic clays to silts and non-cohesive soils (where they are most effective). ‘Soil-crete pillars’ can be created as much as 7 metres in diameter and 60 metres deep. Strengths up to 115,000 kN can be achieved. These columns are all created through small holes of only 200mm in diameter. 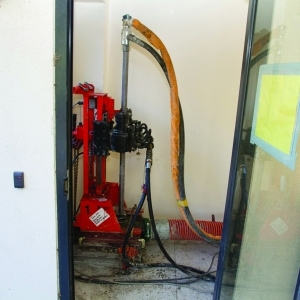 We use a range of machines from man-portable, small 100kg machines up to very large ones. 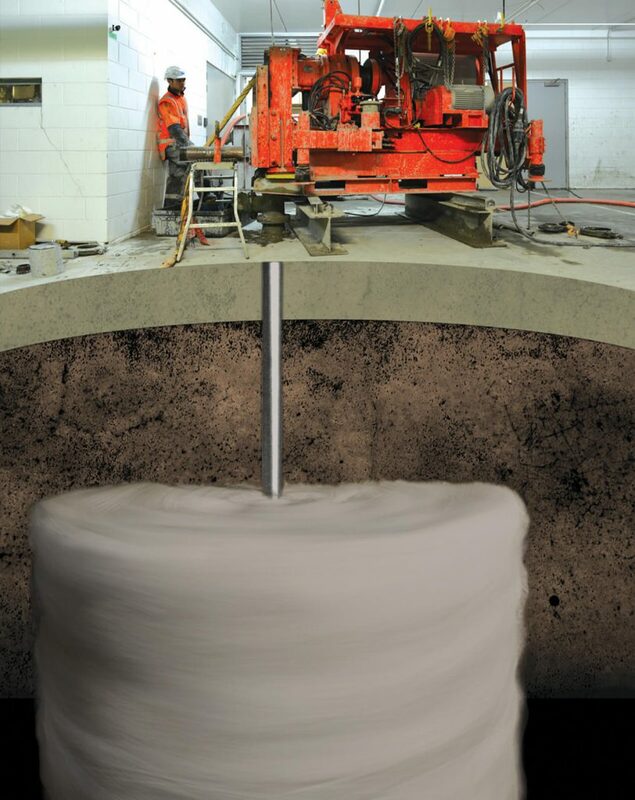 The smallest machines can create columns up to 20m deep and 3.5m Ø, with strengths up to 28,000kN (ucs). Mid size machines can produce columns up to 25m deep and 3.5m Ø, and 28.000kN. The largest: up to 160m deep, 7m Ø and 15,000kN. There is no excavation. The penetrations for drill stems are only 200mm Ø. The cement slurry is delivered to the jet grouting machine by pipe from a mixing unit-hopper outside the building. Excess water and slurry coming back out of the ground is automatically drawn off in large diameter hoses from the drill stem holes and delivered to waste disposal skips.